We were up early and ready to leave the hotel. As usual, the bills were settled in the night. Everything was still closed. We got into our car, got ourselves out of the gate and we were on our way to Thimphu. As per our original itinerary, we were not planning on going to Thimphu again but after cancelling our trip to towns beyond Bumthang and the fact that we still had unfinished business to take care of in Thimphu required us to come back to town. Following were the two main items that needed to be taken care of in Thimphu. We realized that our original permit extensions did not cover Haa Valley. We needed another permit extension for that. During our earlier stay, we could not get personalized postal stamps done. We had always thought that we will do. 4:30 AM We were out of the compounds of the hotel and on our way. 5:20 AM We crossed the first construction zone at Nobding. 6:30 AM Encountered the first instance of what one could call the road rage in Bhutan. One can see in the video below, why Bhutan is happiest country. The truck driver rear-ended the car. See the conversation, how civil it is. The only problem was, when I asked them to move their vehicles to side, I was told that we have to wait till police shows up for evidence. Somehow I squeezed my vehicle through the mess. 8:00 AM Just in time, before the construction work started, we were out of construction zone. In that sense the plan of starting early worked. We stopped at the cafe at Dochu La again for breakfast and may be some more photographs. 9:25 AM We were at Hungtsho checkpost. They will take back the stamped original permit extension. So if you want to save it for souvenir, then it is better to take a picture before this. We drove into thimphu town and straight went to GPO. We thought we can do the personalized stamp business out of our way and then we can check in to our hotel. We has reached Thimphu earlier than the check-in time. There are many countries that do personalized stamp, even India does it. But in India, you can choose an existing stamp and have your photo affixed to the next to it. 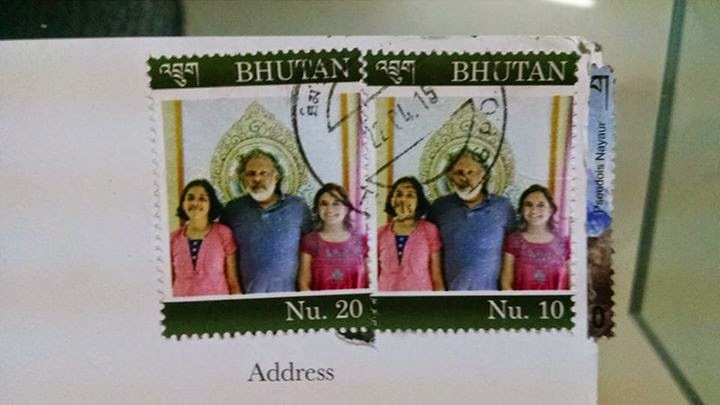 Compared to that the Bhutan personalized stamps are just your picture. These are also valid postage. See on the right, the postage in a letter that we posted to our own address. it was delivered by the time we reached back home and it is duly postmarked. With that taken care of, we drove to the immigration office. I reconfirmed whether I need permit for Haa valley and I was told yes. So I again went through the process, applied for it and then I was told to come back in hour. At this time we decided to go back and check in to hotel and freshen up. We stayed in Le Meridien. Here is my review of the hotel. The rest of the evening was spent in collecting the permit extension, getting RSTA endorsement for new permit extension and leisurely walk across the Thimphu town. I found Thimphu to be a extremely walking friendly town and I enjoyed walking there. Finally we came back to the hotel for dinner and called it a night.